As the Tour de France continues, I thought I would give you a Tour de Kitchen. My kitchen. My little 10 by 14 foot kitchen. My kitchen that is more hallway that kitchen. Welcome. Please come in. No need to take off your shoes. If fact, please leave them on. I didn’t sweep yet today. 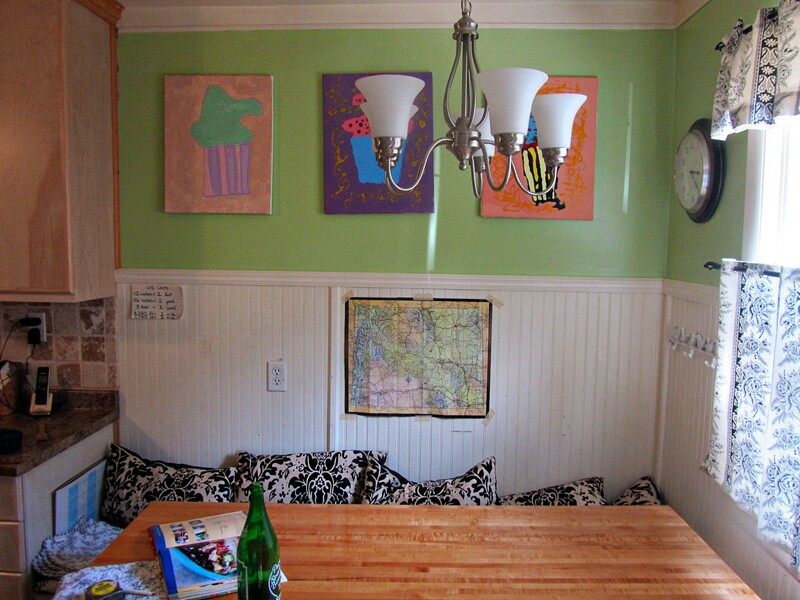 The Pop Art on the wall is by a local artist named Scout. The series is called, “Cupcakes”. I acquired these works of art in exchange for lodging and feeding the artist. The B&W cafe curtains are made from a shower curtain that I bought at Marshalls and that my mom lined and hung. The map is Wyoming. 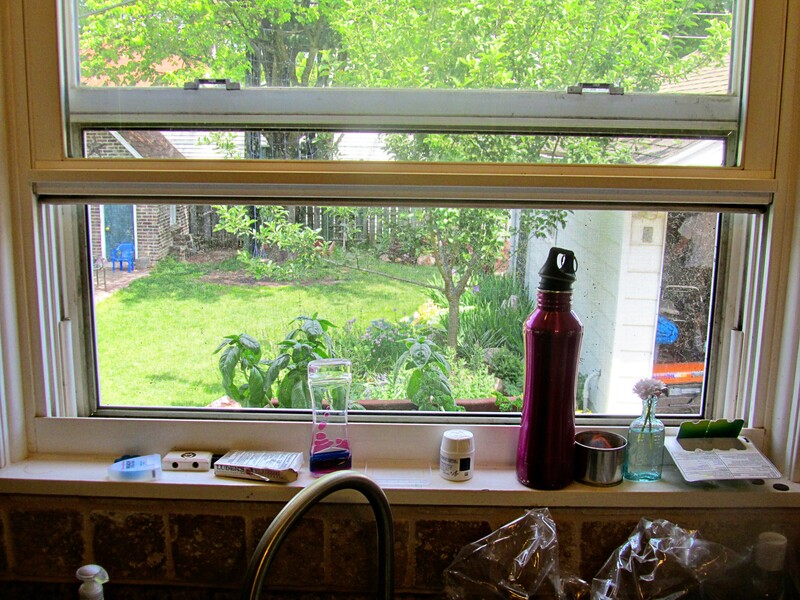 In my cramped kitchen and life, it reminds me of wildness and openness and freedom. And you may recognize my friend Chelan Le Sac hanging up beside my purses. She resides with us. Here is our kitchen table. It is a rescued architect drafting table from the U of Michigan. We paid $25 dollars for it and hauled it away when the Architecture Department was renovating. The drafting table was on metal legs that we set by the side of the road on trash day. We have Professional Dumpster Divers that claim any metal in your trash and recycle it for money. In turn. Our wooden table legs came from our neighbor that set his kitchen table beside the road. The table top in now my husband’s work bench in the garage. The Hunni painted the legs this red color which I love. I exclaimed over his excellent color palate and how the kitchen needed one new color and continued to compliment him until he told me it was leftover paint from our bedroom, and he hadn’t given the color any thought at all. 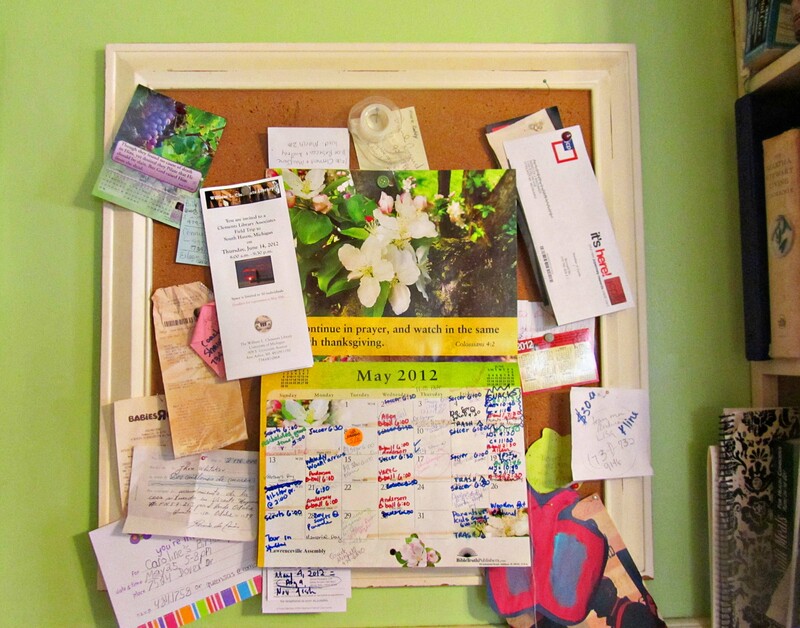 The first basket below the table is my “All Stuff Regarding Mail”–cards, stamps, addresses, etc. . .basket. The “All Stuff Regarding Males” is housed in many baskets in the garage. I don’t usually touch his tools without premission. The rest of the baskets are filled with sewing supplies. It is a bit awkward getting the supplies, but I don’t have time to sew too often,. . .so I don’t have to crawl down there that often. . . .and here. This is where I generally work. 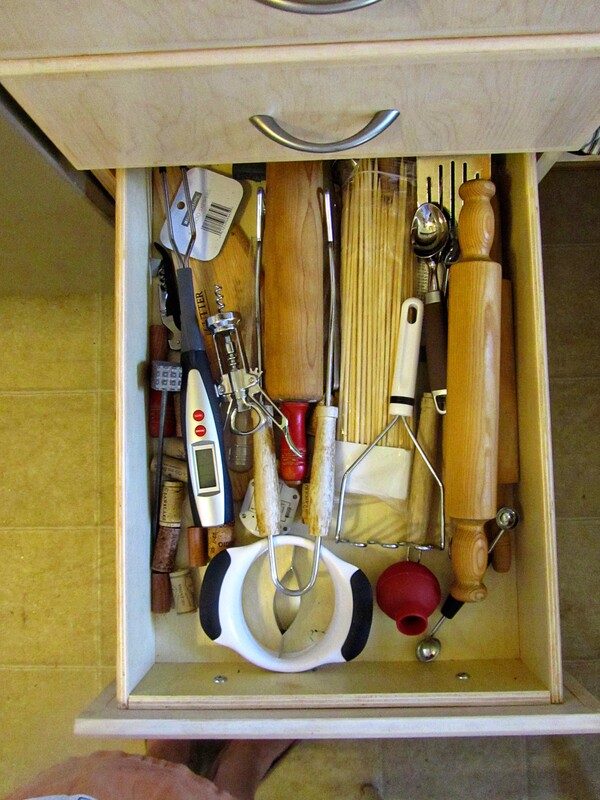 That drawer pulls out and. . .
. . .holds all things sharp. And all things black. 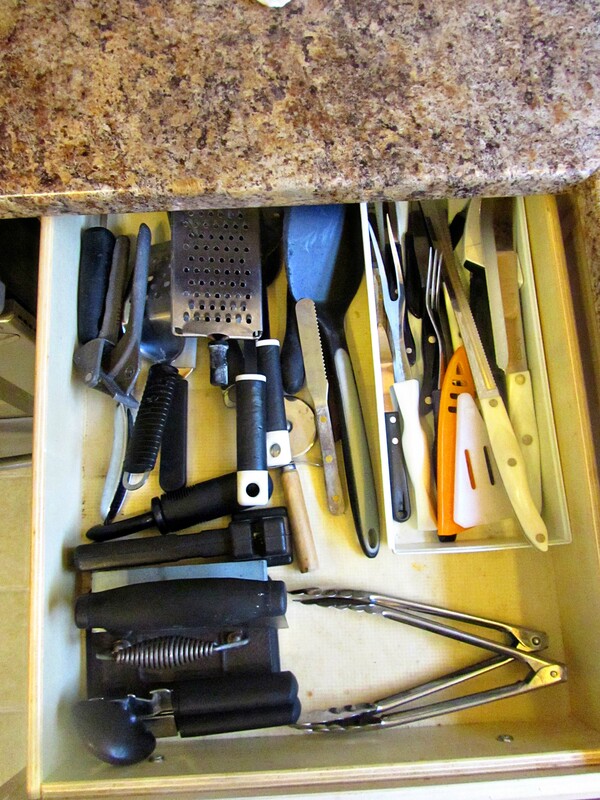 If it can cut you, it goes in this drawer. Wooden spoons and spatulas go in jar on the countertop. Below this drawer is a corner cupboard. This could be a very awkward space except for a wonderful IKEA invention. The shelf not only goes around the corner, but it also pulls out. The Hunni and my Dad had a little trouble installing this shelf as it was designed only for IKEA cabinets. Pots and pans go here. This photo gives you an idea of how far the shelf pulls out. Adjacent to my IKEA pull out cupboard is my stove. My stove is my pride and joy and I love it. I wanted this stove for the longest time and finally, I have a 5 burner gas stove. I previously had three working burners on an ugly, white, stock, electric stove. 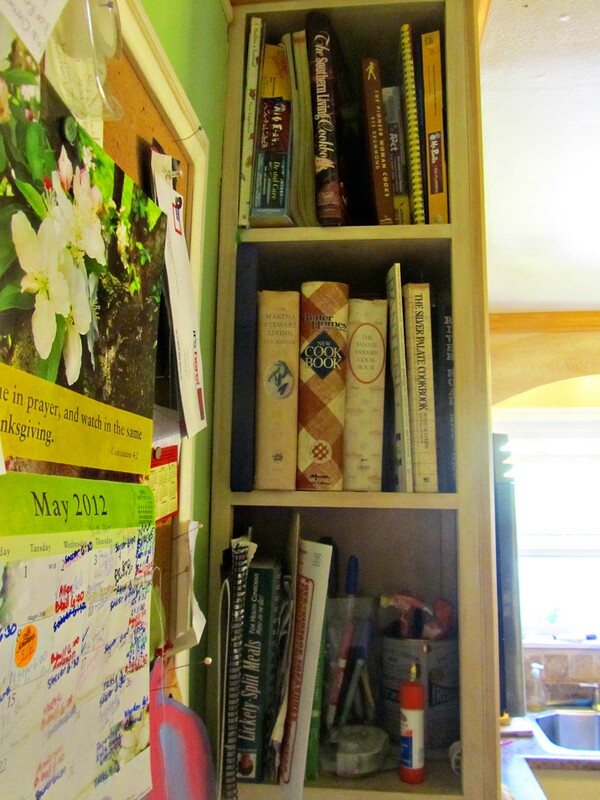 Above my stove and beside my microwave is my Cook Book Shelf. 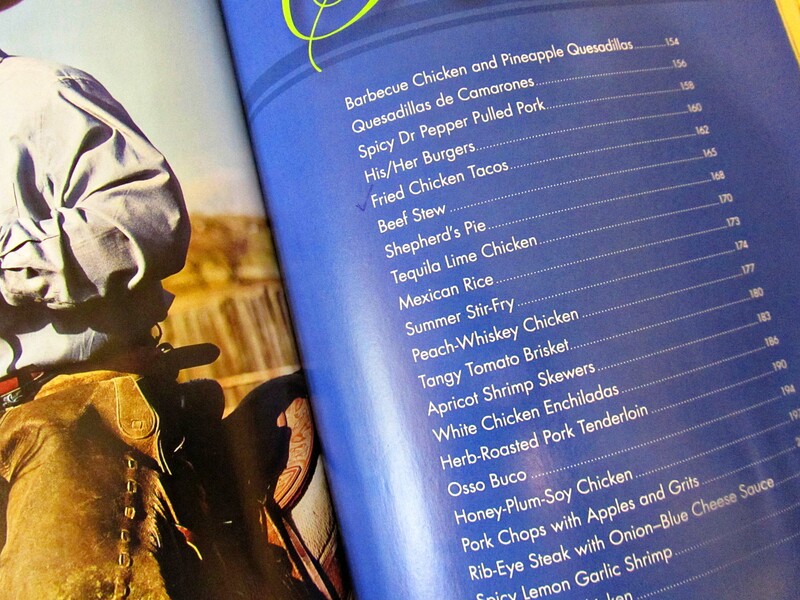 You won’t see Pioneer Woman’s Cooking From My Frontier on my shelf, as it is in use on my kitchen table. 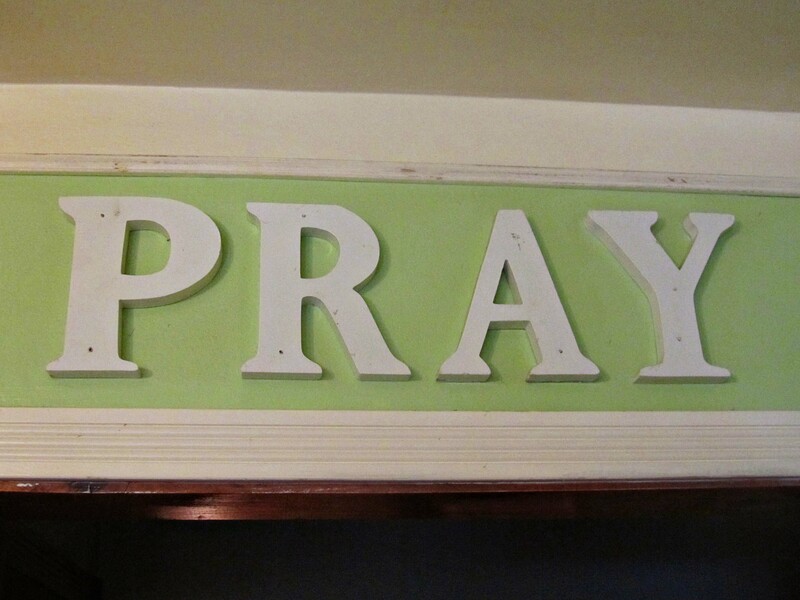 And over the door leading out of the kitchen is this reminder. I don’t often kneel down, but as thoughts run through my head, I send up prayers now and then. I love this poem about prayer and memorized it in college. Beside the door heading out of the kitchen I have the place I store our mail and the mail we get for our friends that are missionaries in Colombia. We have a laundry chute, and I have learned the hard way that I can’t throw down wet kitchen clothes. They can land on a red dress that leaves a red stain on the sweater below it. 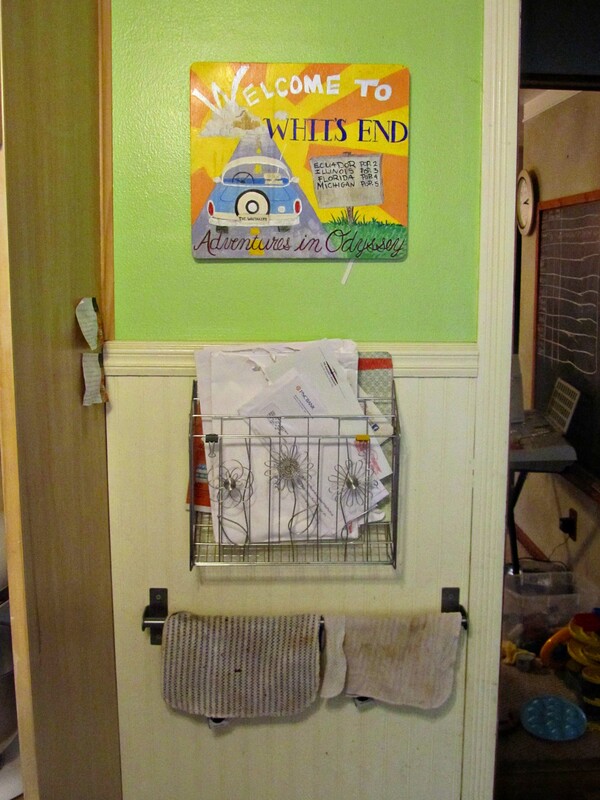 It is ugly, but I have to dry all my kitchen clothes before sending them down the laundry chute. Here’s my appliance section. Sometimes I move them to the kitchen table or countertop when I use them. 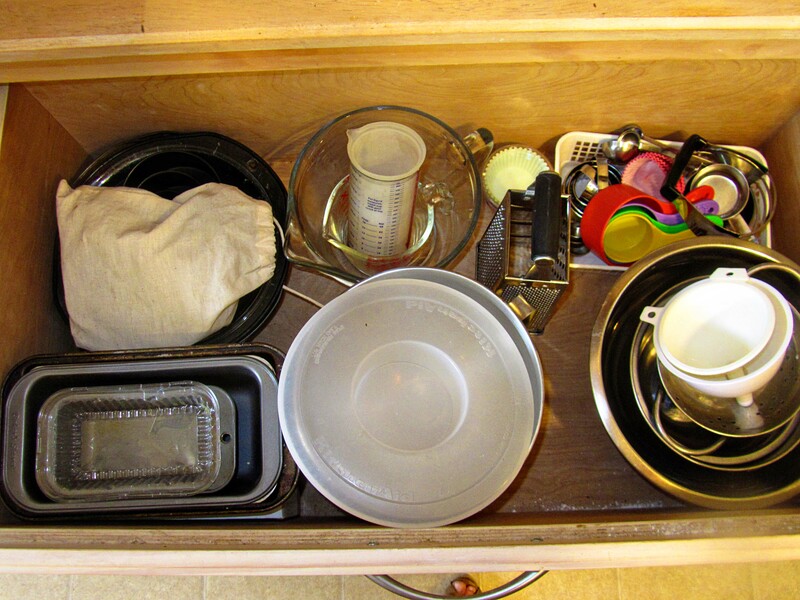 The first drawer below holds all my bowls and baking pans. 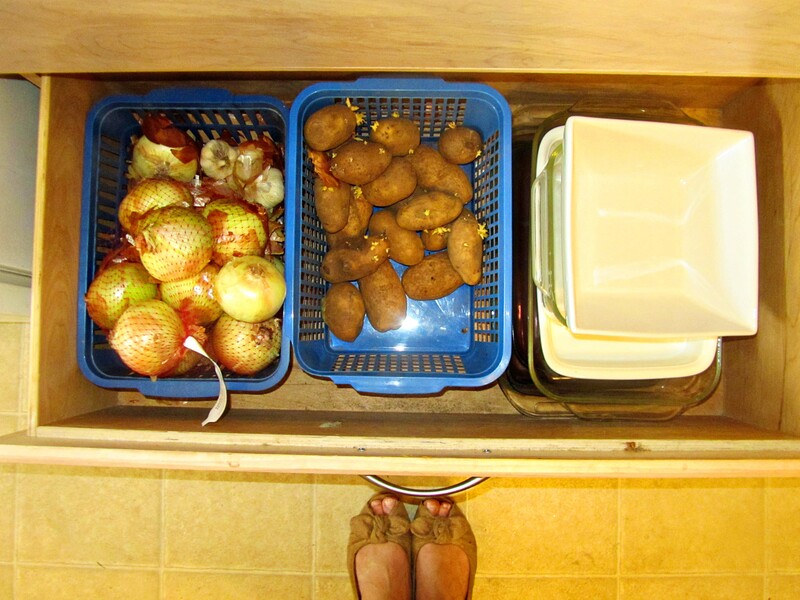 The drawer below that holds my potatoes and onions and casserole dishes. 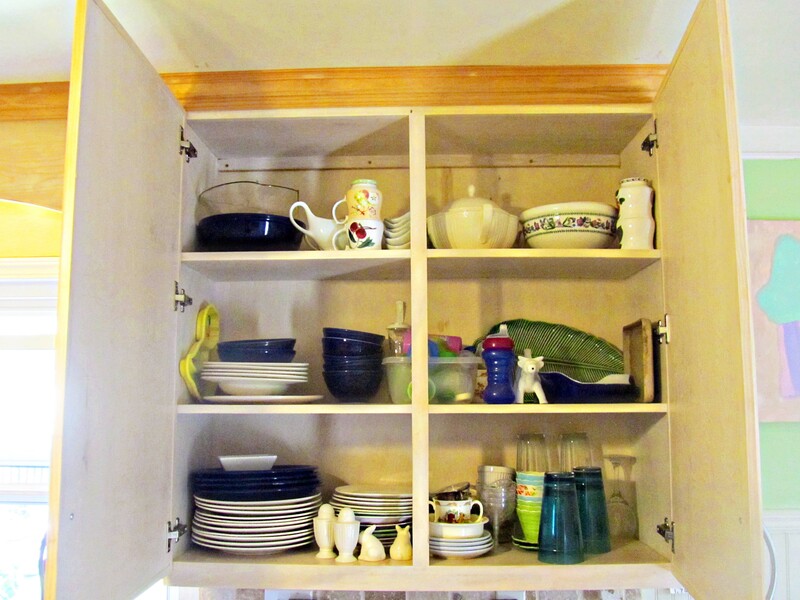 Above my appliances is my Baking Station–flour, sugar, baking soda, cookie cutters, etc. I also keep my Crock Pot and beaters up high. 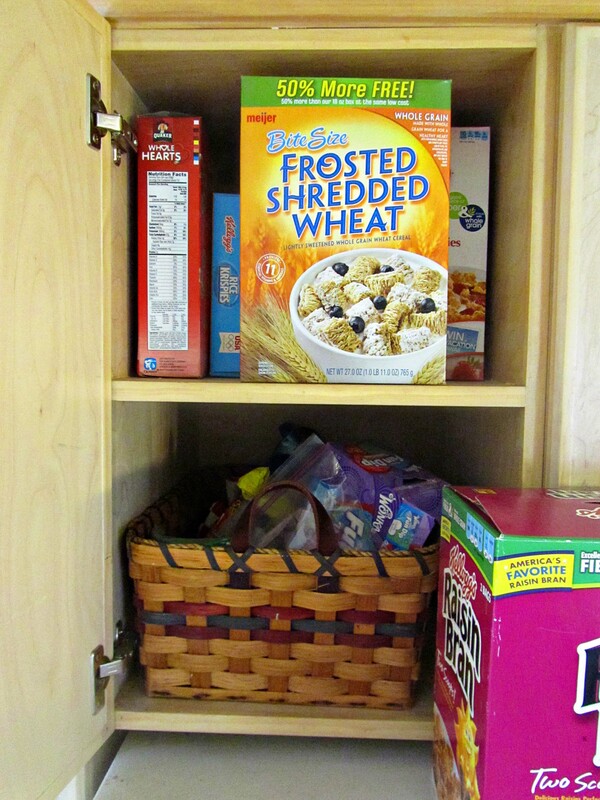 Above my refrigerator, I keep the cereal and the goodies basket. My kiddos often ask if they can have something “out of the basket.” That is where I keep our junk food snacks like Snicker’s bars, or Nerds, or granola bars, etc. . And if you don’t believe me on the granola bars, read the label. My Tupperware cupboard is rather empty, which means that my refrigerator must be full of left overs. 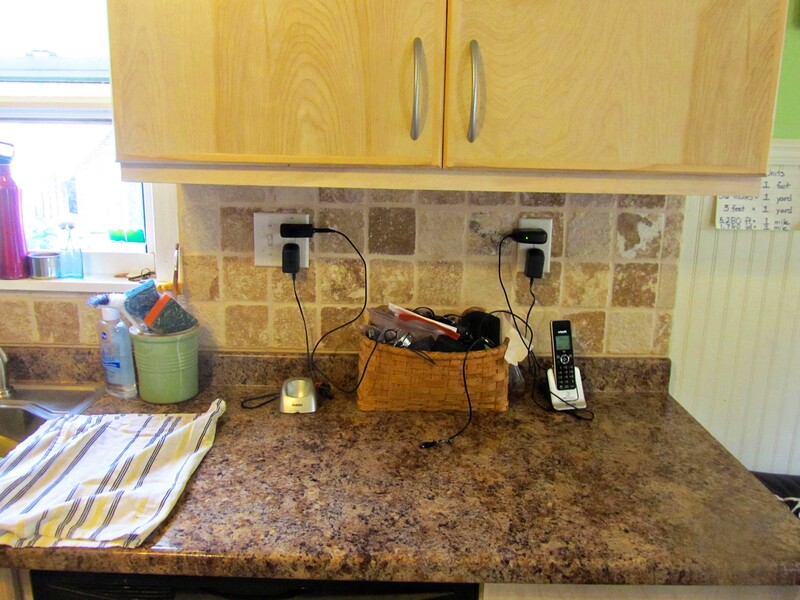 Now if you were to pull out our refrigerator, you would find no drywall behind it–only a stud wall and wires. That is for a reason. In our very small space, the refrigerator stuck out into the room, so we removed the back wall, and slide it back about 2 more inches. 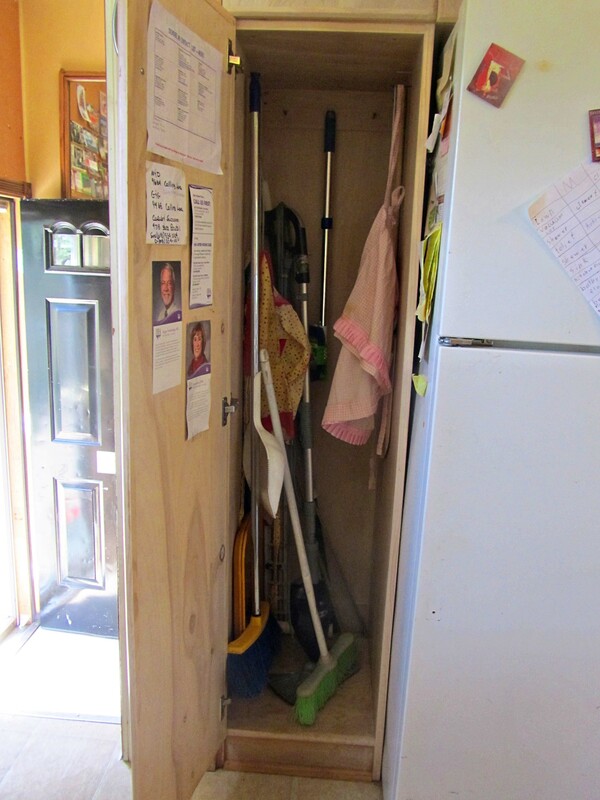 Beside my refrigerator is my broom closet. Inside are taped all the important numbers that I might call–like our pediatrician, my siblings, Poison Control, and Delta Airlines for a one-way flight to Hawaii. 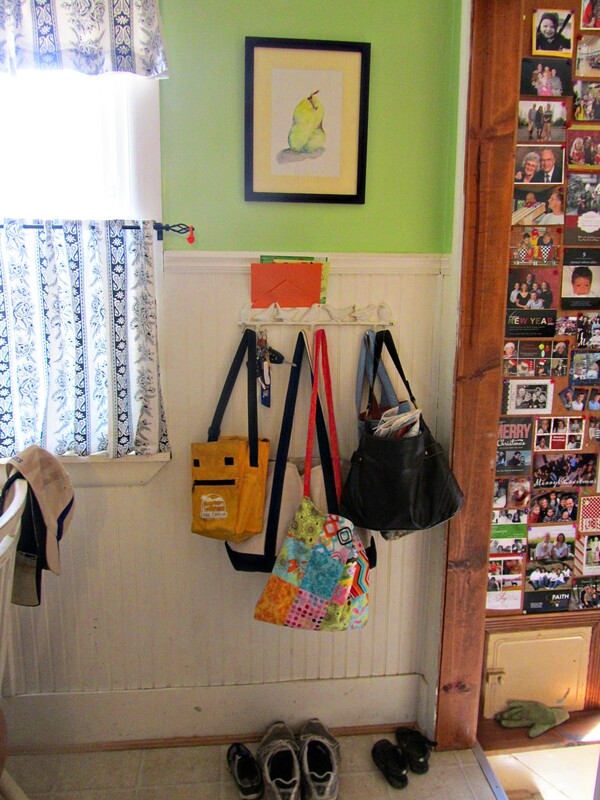 Above the broom closet is my favorite use of space. 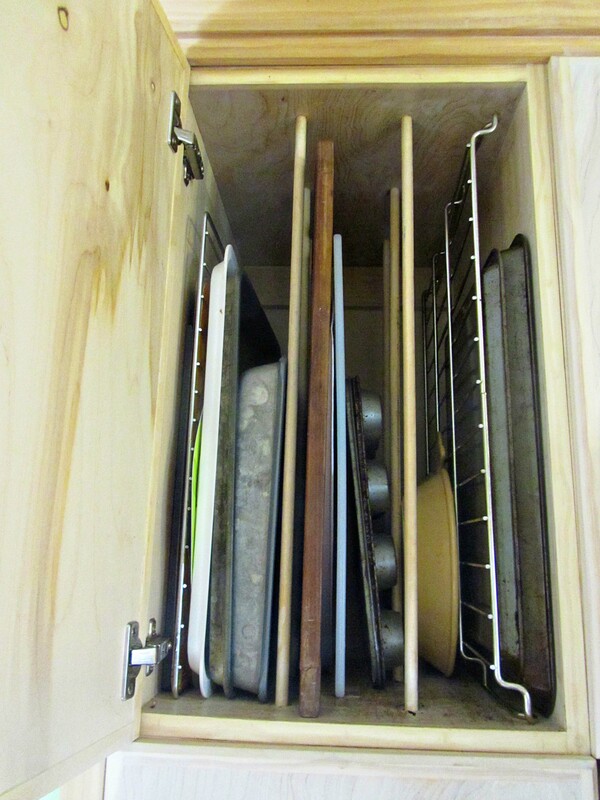 I keep all my trays and cookie sheets up here. 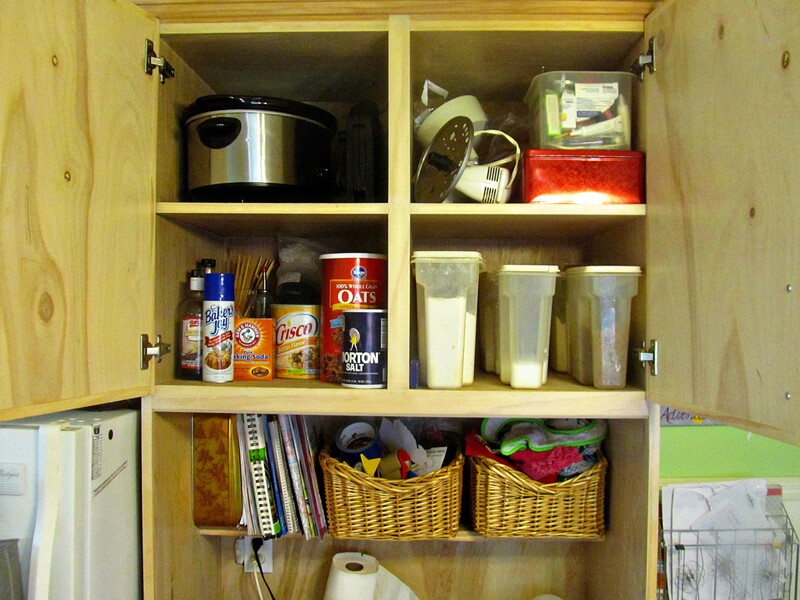 That whole section of cupboards was designed and built by The Hunni. It is one solid piece. 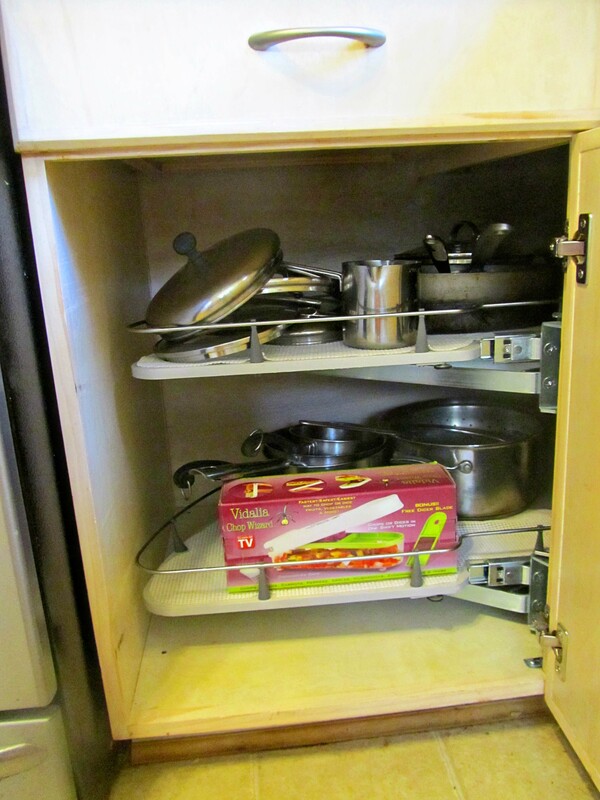 The whole house could be bombed, but this cupboard would remain–it is that over engineered. I know because I had to help lift it into place. Back to this cupboard. If you were to open the doors above, you would see. 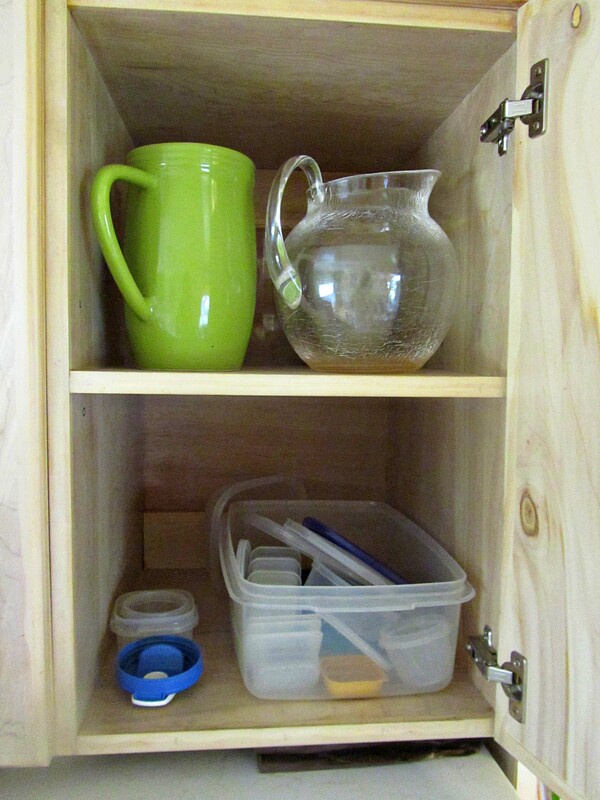 . .
. . .where we store our plates and glasses and bowls and such. All the blue plates are left over from my college apartment days. I still like them, but I love my white Italian Countryside dishes–at least the few that haven’t been broken. 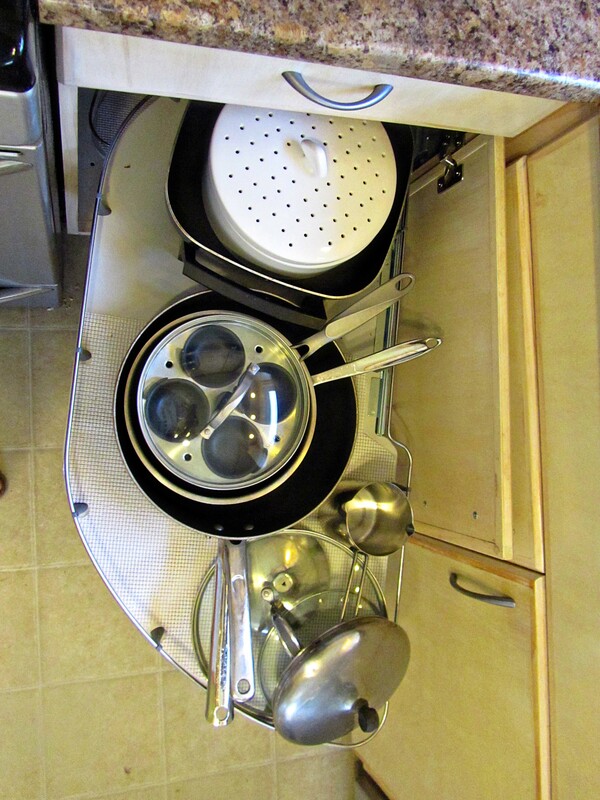 Below the Docking Station Counter top is my dish washer and four draws. The first drawer. 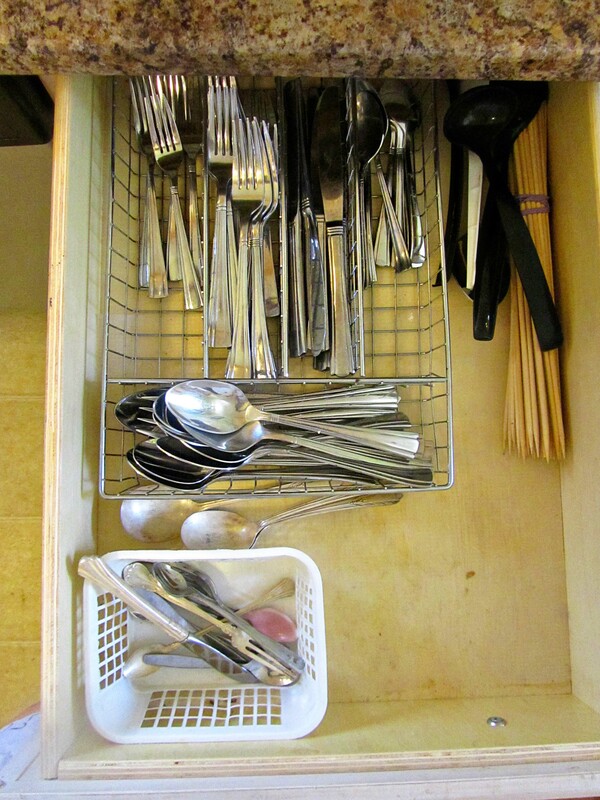 . .
. . .holds our silverware. The second the Seran Wrap and such. The third. . . everything that I don’t know where else to store. 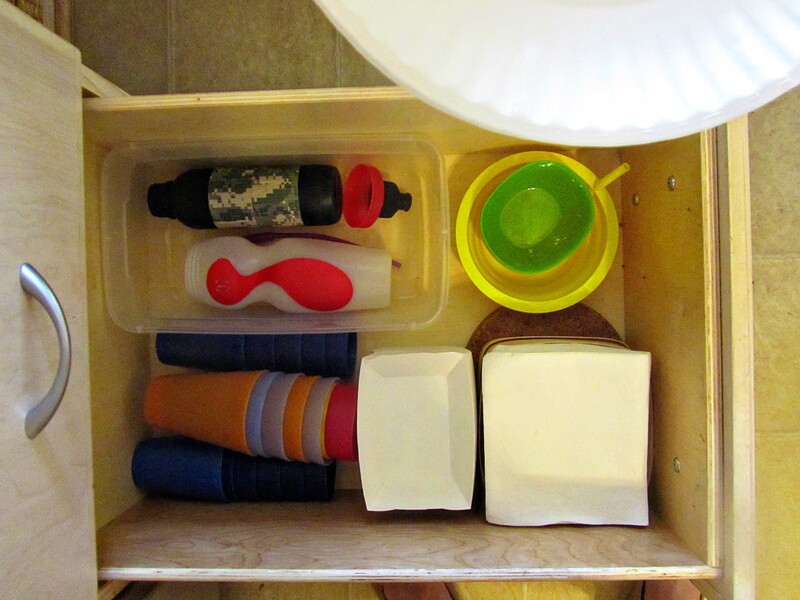 and the bottom drawer holds water bottles, paper goods, napkins, and plastic cups. I moved the plastic cups to the bottom drawer after a summer of being asked for drinks of water a million times a day by both my kids and neighbor kids. 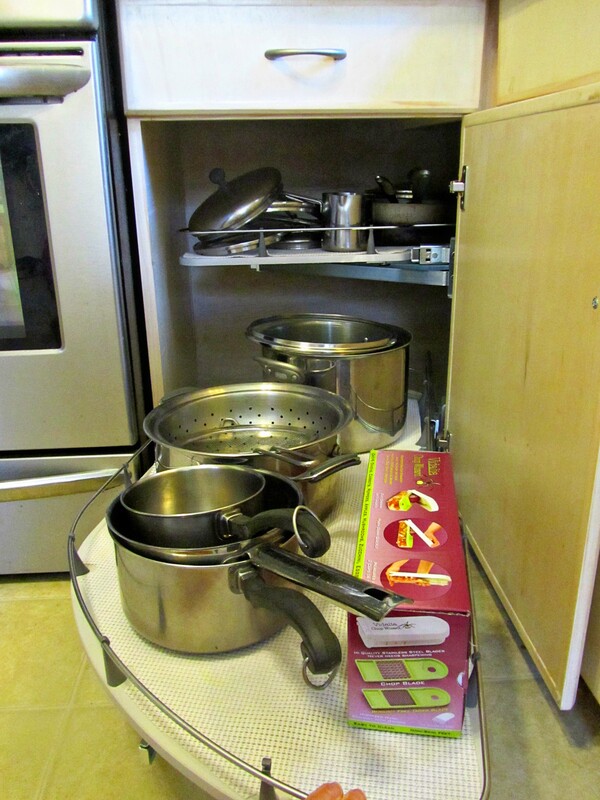 Most couldn’t reach the cups in the top cupboard, and I got tired of the interruptions. Now whenever a new kid comes and asks for a drink, I show him the bottom drawer and tell him to help himself whenever he is thirsty. Here is the view out of my kitchen window. I have a potting bench just outside the window and on the top shelf of my potting bench, I have a planter filled with a few herbs. That way I can just open the window and pinch off some basil. 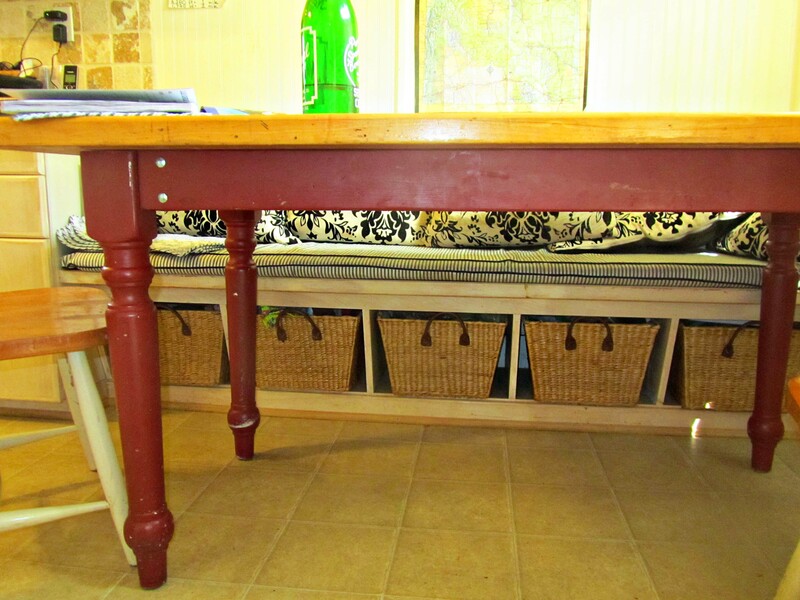 The potting bench also acts as an outdoor ladder to the kitchen window. My kids often climb up on the potting bench to ask me a question, or to have a drink passed out through the window. That way, they don’t have to walk the 15 more steps to come around to the back door. And since we talked about garden hoses yesterday, I will mention that I have also been squirted through the window several times with the garden hose. Since it has occasionally been The Hunni, I have no power to end this baptizing. The screen usually diffuses the spray enough that I don’t get baptized by submersion, but rather by sprinkling. 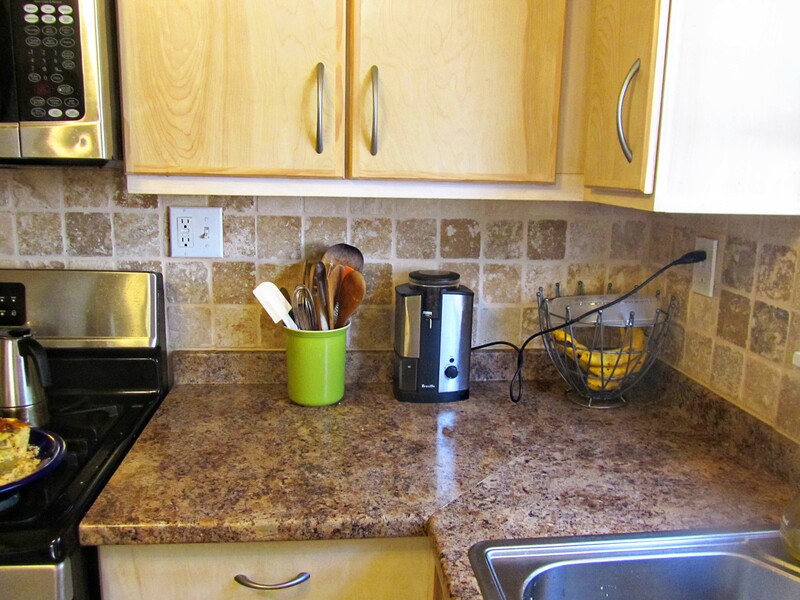 To the left of my sink is a skinny cabinet that is our coffee station. 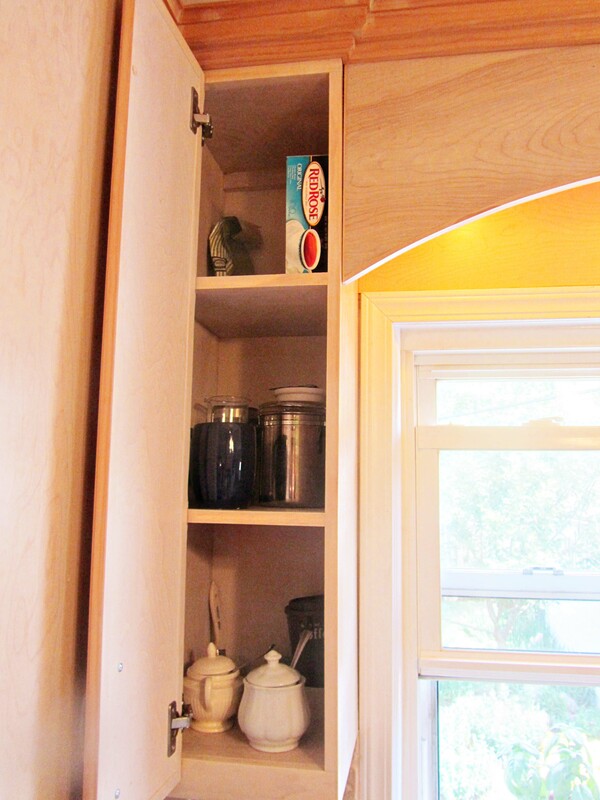 It can’t fit much else, but the skinny, tall, shelves fit tall, coffee mugs perfectly. And now for the big reveal. The guts of the kitchen. 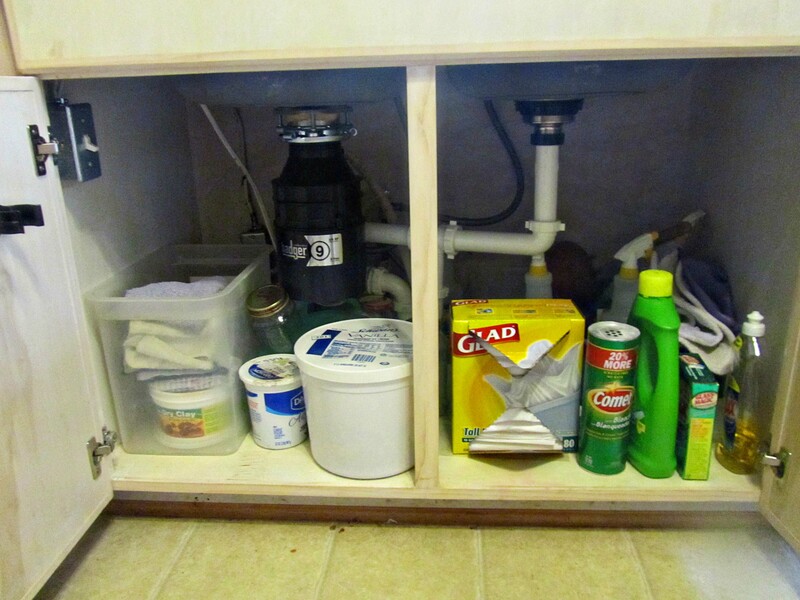 Under the kitchen sink. I know the plumbing under here rather well. I know the plumbing because I have had to take it all apart on several occasions. Let me here inform you what you CANNOT put down the food disposal. You CANNOT put all the rinds of an entire watermelon down the disposal at once. You CANNOT put 8 cups of month old rice down the disposal at one time. This was the worst in that it clogged about 3-4 feet of pipe that all had to be taken apart and “de-clogged” with a stick. And rice stinks after it has sat at the back of the refrigerator for a month. You CANNOT put potato peelings down the disposal. Potato peelings have enough starch in them to form a gluey slurry that plugs the pipes. Since it is a gluey liquid, it can’t be “snaked” out, but has to be plunged out. Onion skins are hard to grind up, but pretty much everything else can go down the disposal. If the disposal has a bit of an odor, just grind up some mint or a half of a lemon, that usually takes care of it. But let’s not end on this nasty subject. Under my sink on the door of the cabinet are two hooks for flashlights. These are my Emergency Flashlights. 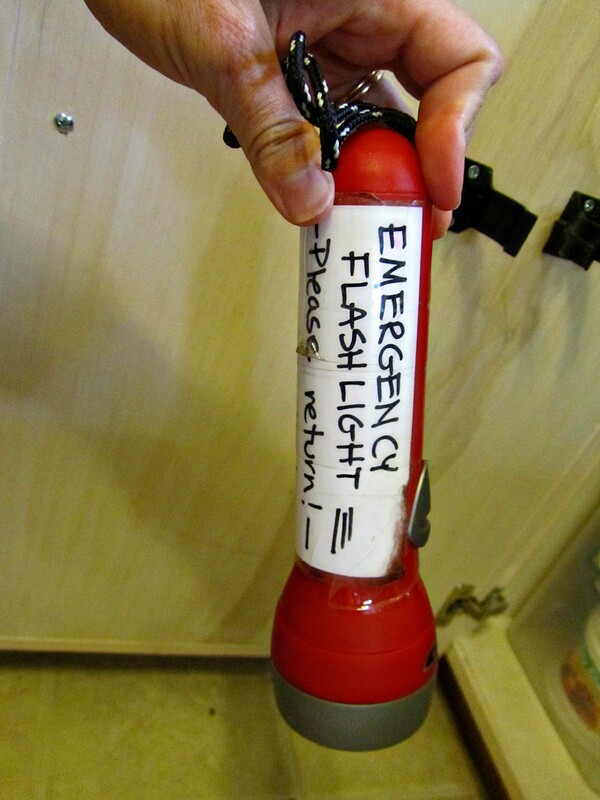 These Emergency Flashlights are for when the lights go out in the middle of a tornado or hurricane or a tsunami or an earthquake. I plan on being One Prepared Mama. I will be able to save us all because I have a working flashlight! But before we leave the kitchen, let’s sit down and see how we are doing on the Rebecca on Ree challenge. 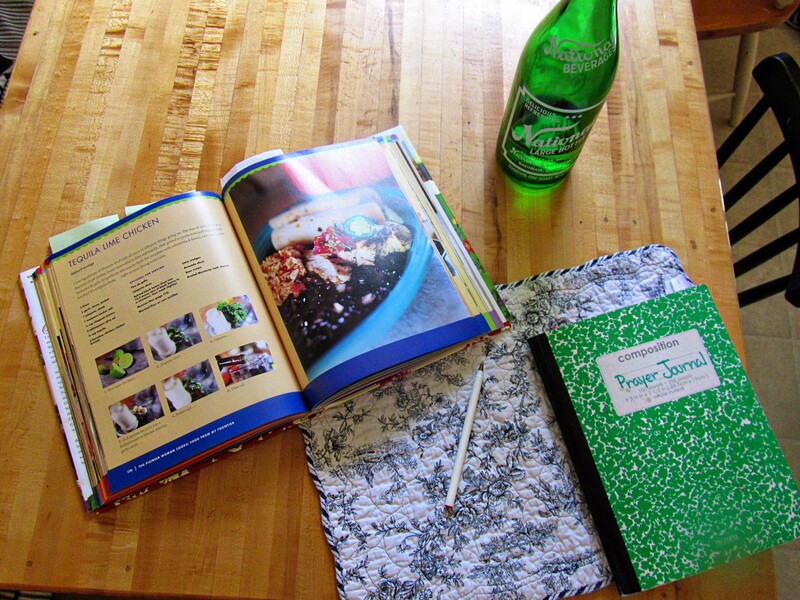 Somehow my “Prayer Journal” got used to chronicle my mistakes in cooking Pioneer Woman’s Cookbook. Here’s the accounting. Five recipes down and eight more to go. Four recipes finished and ten more to complete. I have cooked three soups and need to cook five more. 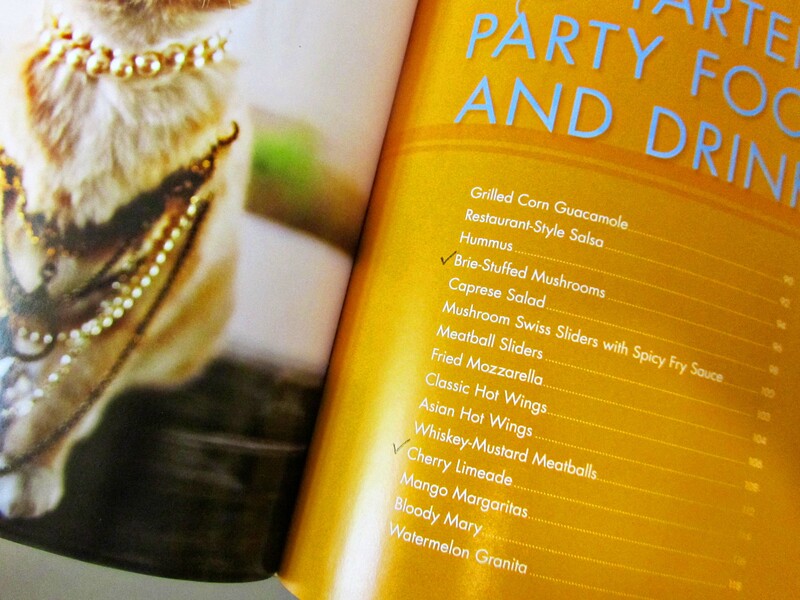 I have a long way to go on the “Starters, Party Foods, and Drinks” category. I have only made two of these recipes. 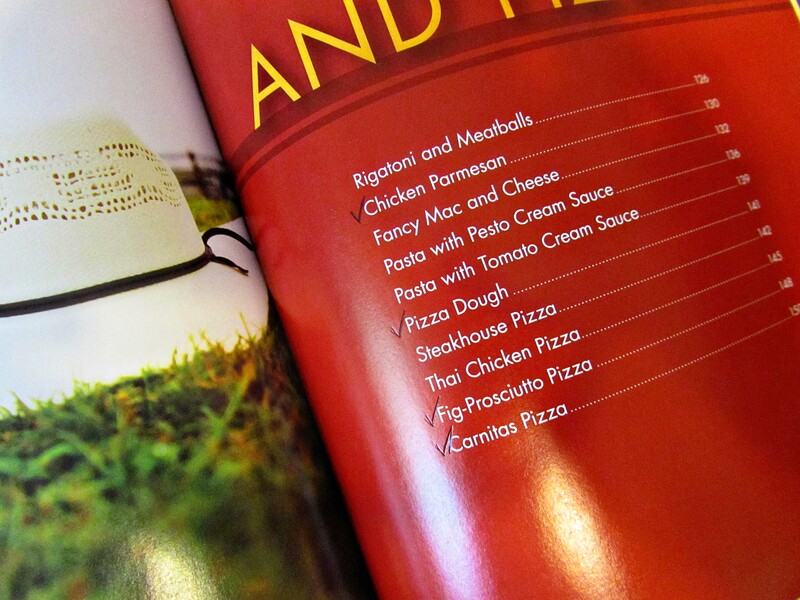 Six more recipes in the “Pasta and Pizza” section. I am looking forward to that “Fancy Mac and Cheese” recipe. Oh Dear! 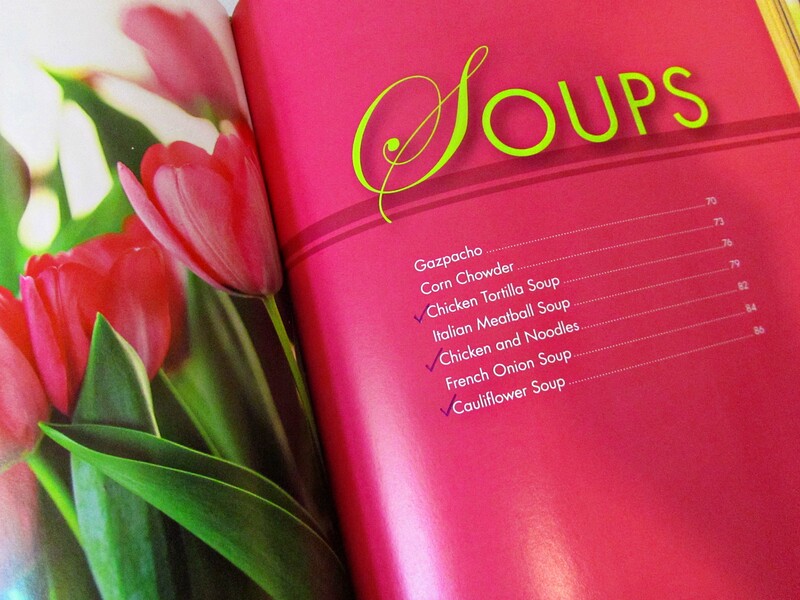 I have a long way to go in finishing up all the recipes in the “Supper” section. These “Sides” have been easy to add to my regular meals. 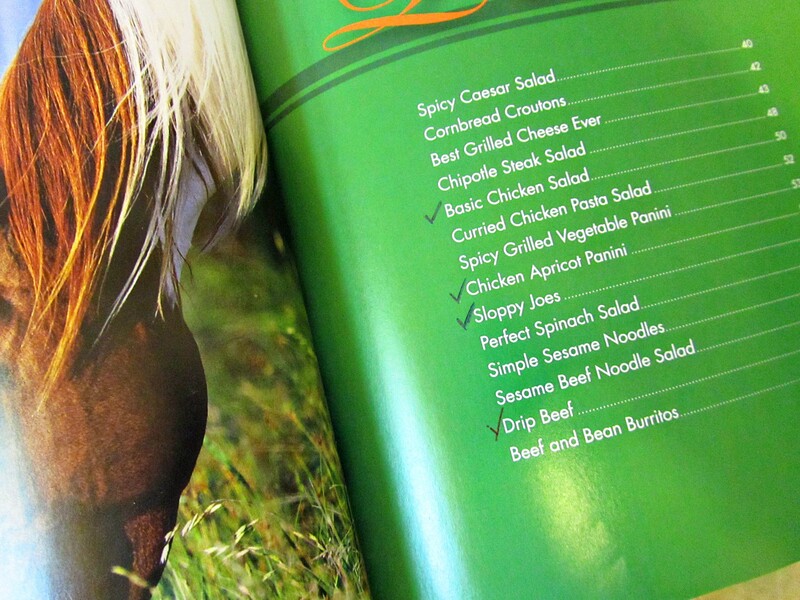 I don’t think I will have any trouble cooking the rest of these recipes. 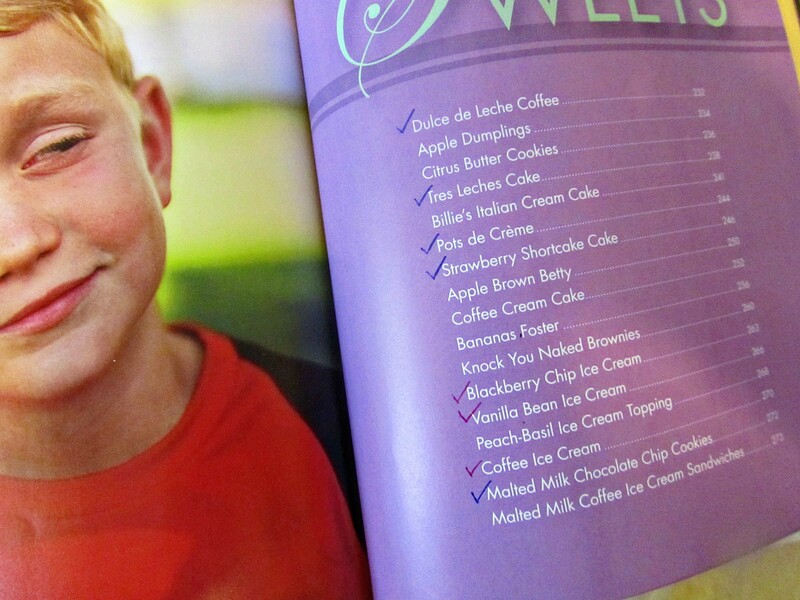 It doesn’t surprise me that most of the recipes I have cooked so far came from the “Sweets” category. I love wonderfully-refined-tastes-divine white sugar. 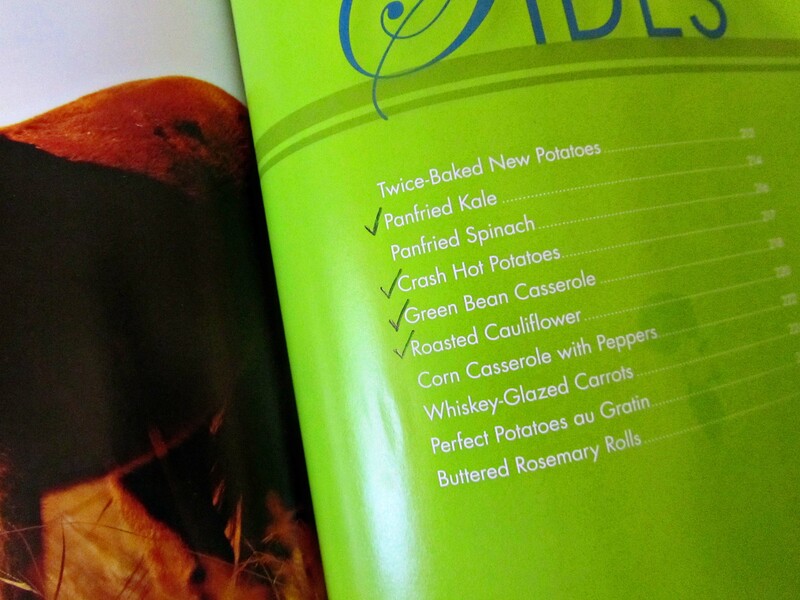 There are also two recipes in the “Canning” section that I haven’t completed. Strawberry are almost ripe, so I think next week, I will be making strawberry jam. Cucumbers are later in the summer, so I won’t get to the pickles for a month or two. I’m enjoying this journey. It has stretched me to cook new things instead of my regular standbys. My grocery bill has increased as I usually base my menus on what is on sale, and now I buy more what is on the list. 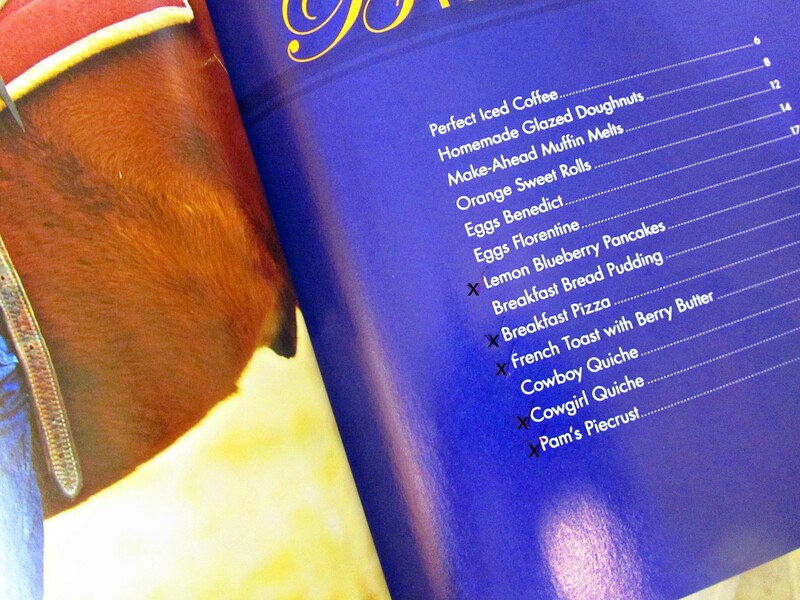 Some of the recipes I have already repeated as we loved them. Some I loved, but the kiddos didn’t, so they won’t make it into our Top Twenty list. Still, they have been exposed to new combinations. I’m glad I started. Hope you are too. P.S. You were pre-warned about the unswept floor. 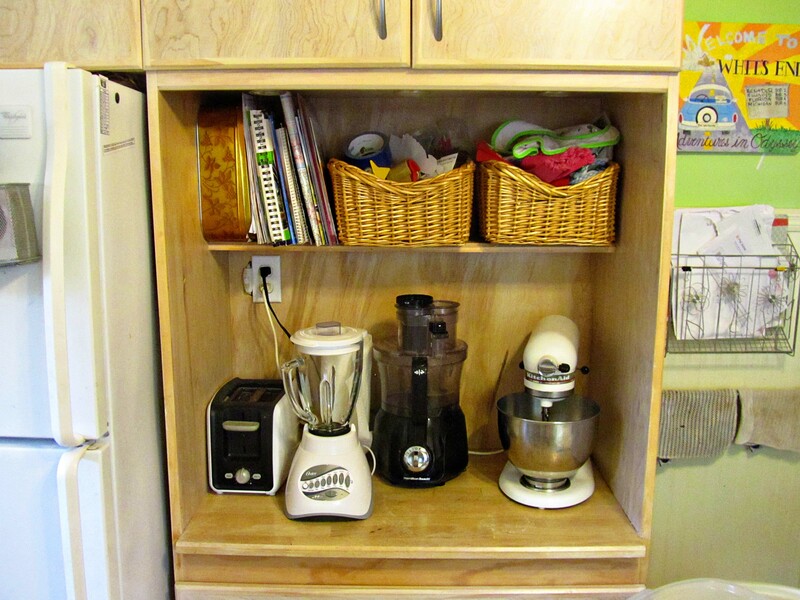 This entry was posted in Recipes and tagged kitchen tour, small kitchen. Bookmark the permalink. 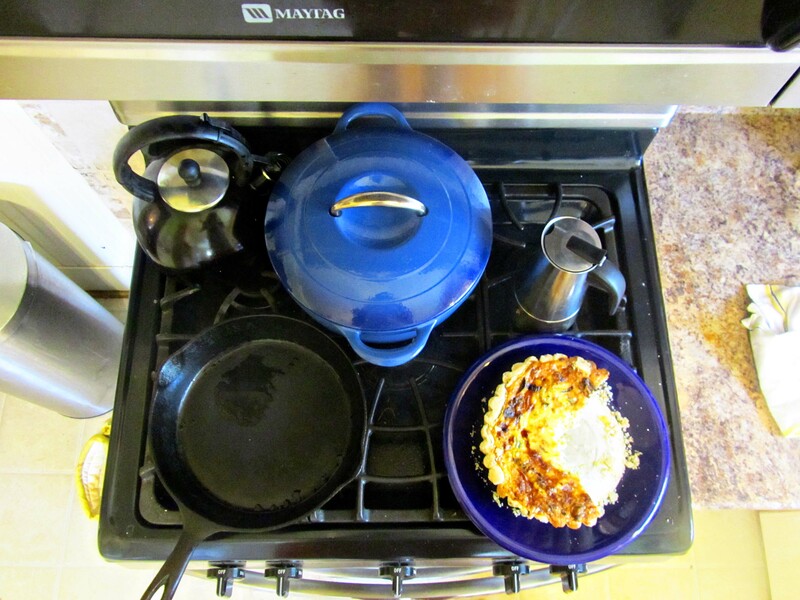 My smiles from this post … over engineered, the one-way ticket, your stove (I lived with a two-burner stove for four years before this house and one of them was teensy), your calendar, and your tupperware area. 🙂 I think I have the same backsplash as you! Beautiful, cheerful, lively kitchen. How did we do it with so few burners???? I still wonder. I just got back from my mom’s and she had moved some things around in her kitchen. I was so confused. 🙂 I guess I am a creature of habit. Loved this post! Why is it so fun to peak around someone else’s kitchen? I need that number for the one-way ticket to Hawaii, by the way. Well Miss Rebecca, I thought my kitchen was small ( because even though it has a lot of floor space it has four doorways and very little counter space. BUT, you gave me some good ideas to use the space I have, better. Now, can you help me find the time? We are home for two days, head to Illinois for ten days, home for 5 days, head to Minnesota for 4 days, Then home for many days. Maybe then. On all of your posts, you always include a verse. Is that a “signature” you can add, or do you just type it in every time? I’d like to add something like that. 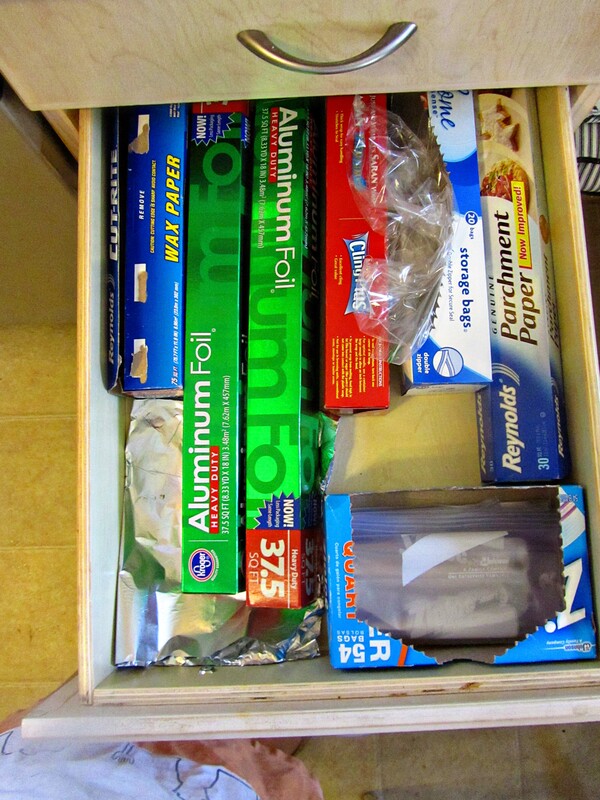 Plastic cups in a bottom drawer – genius! Thanks for the tour and the inspiration! Although it is not my “dream” kitchen in any sense, it is what we currently have, and I am trying to make the best of the limited counter space and awkward floor plan. Thanks for stopping by.